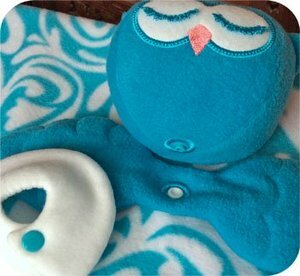 Our adorable soft blanket babies are perfect for toddlers and as shower gifts. 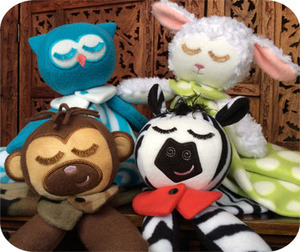 The sweet lamb, monkey, owl and zebra are made using fleece or a combination of fleece and other soft materials. They are washable and look great with a monogram added to the blanket. The heads are 3D spheres. After the face, ears, arms and collars are stitched by your embroidery machine, the heads are sewn together using a sewing machine. The ears are also attached with a sewing machine. The heads & arms are stuffed with poly-fil. A 5x7 hoop is required to stitch the faces and collars. The ears are stitched in a 4x4 hoop. The arms & wings require a 7x12 hoop. If you do not have a hoop this size, printable patterns & instructions are included for you to easily make these using a sewing machine. The only hand sewing is to close up the opening on the head after stuffing it. When finished, our blanket babies measure approximately 24" long. The heads securely snap to the blankets keeping the arms in place. A collar finishes each blanket baby. They all have sweet faces with fringed eyelashes.